Ixobelle (archived): Where Ixo Invades Europe! 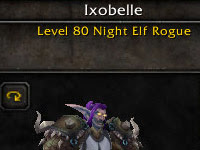 Let's just say in my spare time I've been leveling a Night Elf rogue in secret! ON A EUROPEAN SERVER! And let's just say, for the sake of conversation, that silkworms are amazing animals that help provide humanity with all sorts of wonderful things that make the world go ROUND. LIKE IT'S A ROUND WORLD WE LIVE ON, AND WONDERFUL THINGS LIKE SILK ARE MADE POSSIBLE BY OUR FRIENDS THE SILKWORMS. k? We all on the same page here? Did I lose a few of you? That's okay. Now that that's out of the way, let's skip straight to the part where I tell everyone how much of a horrible rogue I am, and how much that class has/hasn't changed since I last really PLAYED (like PLAYED, not just LEVELED, see what I did there?) a rogue. Yes, you still keep slice and dice up, while a rupture ticks, but now you also mutilate (from any direction! mutilating from behind is so 80's!) while keeping Hunger for Blood up, and you can forget about renewing your SnD stacks... in fact, a one point SnD magically becomes a 5 point one if you can envenom to the beat! Ugh. I'm tired! I'm typing this up at 3am (3:54 as I hit 'publish post', time travel ftw! and yes, this honestly took me an hour to type up. read it slowly! ), and I just finished a VOA where my dagger broke, mid-run... I suddenly noticed my unarmed skill climbing the pop charts and thought HUH... WHAT'S GOING ON THERE? This is comical, because I was just chatting to my friend about how noob the run was because the attempt before my dagger broke, the MT apparently tried to hold all of Emalon's unbridled rage focused on him based on nothing but his charming good looks, since his sword and shield had both broke the last wipe (unbeknownst to us). So here I am, suddenly opening my character pane to see a little red ring of death enveloping my dagger in its deadly embrace. 12) I already mentioned the whole "tank's crap just broke 5 min ago" so let's just move along... In my defense, I'm honestly just not used to wiping over and over on VOA. Anyway... I passed all this info along to my Commander in Chief on the European front, and all she had in exchange was LoLs. Who is that, you ask? Oh, perhaps you may recognize her from somewhere... ? And here I was thinking I had an easy 'in' with Adrenaline, Larísa's guild, providing I could send tells from a level 80 alliance EUROPEAN toon! Turns out that she just takes out the trash after the guild is done raiding for the night! Don't be fooled, we are internet superstars only on these pages.... log into WoW, and that all goes down the tubes. We are but humble servants to the greater good of our guilds! Recently, I feel more of a slave to the whims of PUGs, but ALAS (!) that's a post for another night! OH, I BET IT WOULD SOOOO BE DREAMY TO RAID WITH IXO! I BET HE TOPS EVERY METER; ALL THE TIME, ALWAYS! More like: WTF, IXO. L2REPAIR AFTER WIPES. "Don't be fooled, we are internet superstars only on these pages.... log into WoW, and that all goes down the tubes. We are but humble servants to the greater good of our guilds!" ignito was leveling wand skills. Hugs Ixo! I'm really just a humble servant, that's true. But God, was I glad to see you? I'm so thrilled!Can't wait to see you next time and find up something fun to do together! You really made my evening. Maybe I should reactivate my Euro account... it doesn't count as going back right?? ...and it goes on and on. hot damn, seventeen exclamation points. I was in a kooky mood last night! Good times were had by all, and more will be had in the future I'm sure. I've also branched out into another server on my (horde) priest, which ALSO remains unguilded, but the top secret blogger connection there is one who prefers to remain anonymous. I can respect that. I've also recently begun leveling my 67 alliance hunter on Zul'jin to play with old roommates from America. It's kind of just really soaking in how much you can *do* with WoW, that isn't actually PLAYING WoW. There was that whole thing a year or two back about WoW becoming the new digital version of going golfing with someone (golf is more about taking a walk and chatting/bonding than actually putting little balls in holes), but I didn't really buy it back then. I think I finally 'get' what they were driving at, and am beginning to realize the purpose of having toons on multiple servers. I used to always have all my 80s clumped up on one. Maybe it's time to finally spread the Ixobelle around, baby, yeah! What a great blog! Larisa pointed me over here with her blog post, and what a great job she did! Ill have to add you to my, small, but growing, blogroll! "Knuckle Sandwich" achievement before you were able to correct the situation. Now that would have been priceless! Surreal to see Larisa in the "flesh" in an actual in-game screenshot, too. Just got myself another subscription on my google reader! 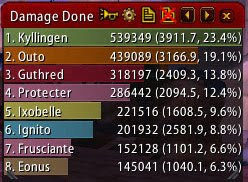 Only 2 people above 3k dps... I'm shocked you managed to down Emalon. That does sound like a horrible horrible pug. Still, funfun.